When Russ Jones pitched "Creepy" to James Warren in 1964, the outcome may have been drastically different if Frank Frazetta had not been involved. Frazetta painted eight of the first ten covers of 'Creepy'. The only two he didn't do were #1 (a 'safe' cover by Jack Davis) and #8 (Gray Morrow). These are legendary covers. 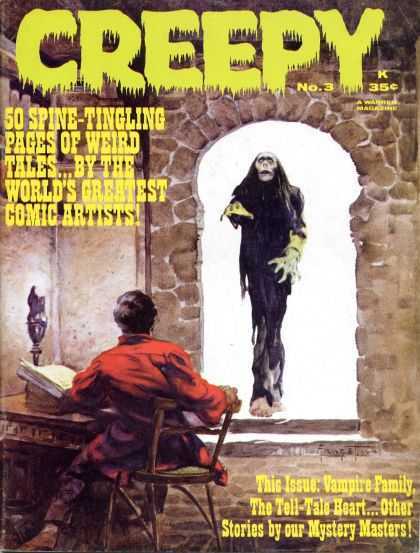 I could have chosen any, but I went with the cover 'Creepy' issue #3 from 1965. Again, because it's symbolic. It was a tough call, but this cover is the essence of horror. It is a study in contrasts. It is the sudden juxtaposition of the real with the unreal, light and dark, culture and primal fear. A cultured, intelligent man is suddenly confronted by the forces of darkness while reading. Does this mean that by reading 'Creepy' issue 3, we too will be visited by the supernatural? This monster is framed by white light. We thought the light was there to protect us, but instead it only illuminates the horror of the thing at the door. 'Creepy' faced a monumental task at re-establishing horror in a comic format. Like EC's 'Mad', it had used the magazine loophole to get around the Code, but was the public ready to buy it? By bringing forward the best of the best and perseverance, Warren succeeded. And Frank, you were the best of the best. 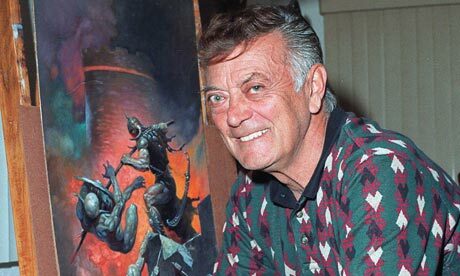 Frank Frazetta passed away in May 2010.